My daughter has Down syndrome. The anti-abortion movement is using her to restrict both of our reproductive rights. Bills that restrict abortion access, like the one in Ohio, do nothing to improve the lives of people like my daughter. 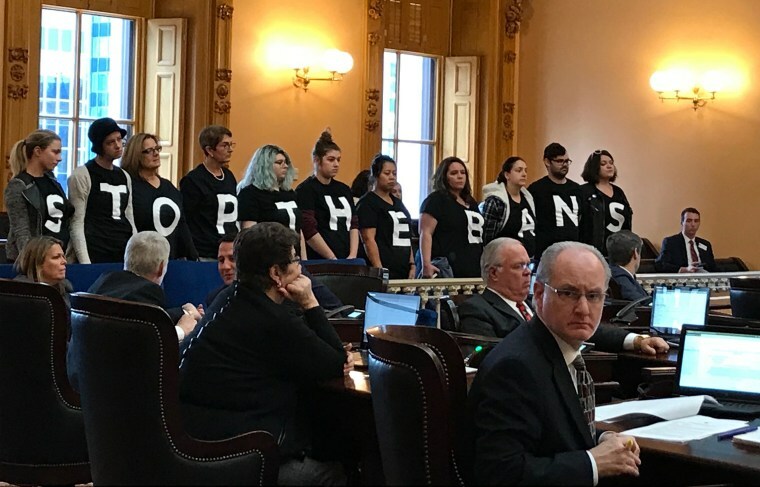 My home state of Ohio has done something only a few other states have attempted: It passed a law to prohibit doctors from performing abortions if the women seeking them are aware of the Down syndrome status of their fetuses. I can't say that I know what it might be like to decide to end a pregnancy after such a diagnosis: I declined amniocentesis each time that I was pregnant because I knew that I would not end a pregnancy of a fetus with a diagnosis of Down syndrome. And my last child, in fact, was born with Down syndrome. I oppose bills like these because they do nothing to improve the lives of people like my daughter. Instead they use children like mine to chip away at my reproductive rights — and hers. Here in Ohio — where the Republican Party has controlled all three branches of government for the better part of 20 years and consistently pushed for some of the most restrictive anti-abortion laws in the country — cuts in funding to assist and educate the developmentally disabled are routine. For instance, the case workers from the developmental disability board in my county told me that therapists were once sent to the children, either at their homes or daycare facilities. Then, the state cut funding to the boards, effectively eliminating these essential services. And, not only does Ohio provide significantly fewer resources than our neighboring state of Pennsylvania, within Ohio, funding for disability services and supports varies wildly from county to county. If these politicians and activists actually cared about the lives of people like my daughter, they would be pushing for significant increases in funding to help people like her lead fulfilling lives, rather than trying to broadly restrict the rights of women in the state. After all, despite massive inequities faced by people with disabilities in states like mine, today is the best time in all of history for people with Down syndrome in America. People born with the condition now live with their families, as opposed to being institutionalized at birth as they once were here and often still are elsewhere. Many attend typical schools — including college — and adults often live independently, have jobs, drive cars, fall in love and get married. And though organizations that oppose my reproductive rights solely focus their attention on passing laws to restrict women's choices in the name of people with Down syndrome, each year since my daughter’s birth, I talk with medical students at a nearby university, emphasizing the importance of knowing and distributing accurate, up-to-date information to patients whose fetus or newborn is diagnosed with Down syndrome. In addition, I write a regular column for my local newspaper to educate the public about what a Down syndrome diagnosis really means and (perhaps most importantly) to dispel outdated and often patently false notions about people like my daughter. For years before this legislation reared its head, disability rights activists of all parties worked together on a pro-information movement. In 2008, a federal law passed requiring current information to be given to parents who receive a Down syndrome diagnosis during pregnancy, but it did not provide funding for new materials, limiting its potential impact. Several states also have pro-information laws but have failed to implement comprehensive programs to meet the requirements of those laws. Meanwhile, women and their families continue to receive negative misinformation about Down syndrome starting at the time of diagnosis. The pro-information movement has essential work to do: Not only does accurate information help a family make an informed decision about whether to carry a fetus with Down syndrome to term, it improves the understanding of the diagnosis in every phase of that child’s life, wherever they go in society. This is so important because one of the reasons that people with Down syndrome are succeeding in the modern world in ways that would’ve seemed unimaginable just decades ago is early interventions. Physical, occupational and speech therapies started in infancy propel children to earlier and greater successes in mobility, speech and cognition. My daughter started these essential therapies in her first weeks of life — but only because I can afford both the money and the time required. But when I think about these anti-abortion bills, I imagine the parent who takes public transportation to her two part-time jobs. How is her child going to receive early interventions to lead his best possible life as an adult? If Ohio's Down syndrome abortion ban is upheld, babies born with Down syndrome to mothers of modest means (some of whom might have chosen other futures for themselves) will continue to have limited time and resources to help their children reach their full potential. And the anti-abortion movement will move on to the next piece of anti-abortion legislation without considering the impact they've had on real people's lives. A sad reality is that the disability rights movement in the United States does not enjoy the attention and funding given to the anti-reproductive rights movement. Unfortunately, the nationwide push for Down syndrome abortion bans has all but killed the bipartisan, pro-information movement. And to me, as a mother of a child with Down syndrome, that seems almost criminal. Holly Christensen is a mother of five from Akron, Ohio where she teaches English composition at the local university and is a columnist for the Akron Beacon Journal.